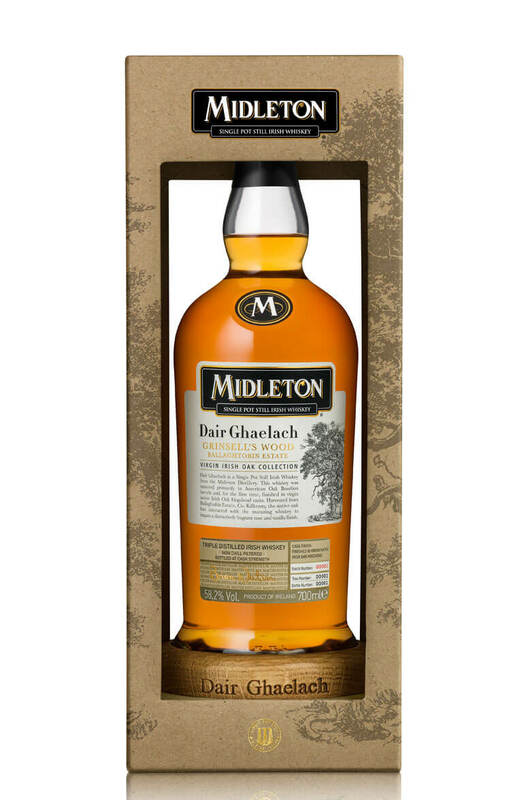 Midleton Dair Ghaelach, is the first ever Irish whiskey to be finished in virgin Irish Oak Hogsheads. This uniquely Irish expression is the latest addition to the Midleton Single Pot Still family of whiskeys, satisfying the growing appetite among whisk(e)y lovers for discovering new and innovative styles of Single Pot Still Irish Whiskey. At Midleton, a selection of traditional Single Pot Still Irish Whiskey distillates, matured for between 15 and 22 years in ex-Bourbon casks, were married together before being filled into native Irish Oak Hogsheads harvested from 130 year old oak trees from Grinsell’s Wood, within the Ballaghtobin Estate in Co. Kilkenny. This special whiskey is the true and unique flavour of Ireland. Its provenance as individual as its fragrance, its journey from grain to glass as distinguished as its finish. This bottle was made from whiskey matured in wood from tree number 4. Nose The crisp Pot Still spices are seamlessly enriched by the woodland fragrances of the Irish oak. Sweet vanilla notes are given depth by some chocolate honeycomb and coffee beans, whilst the balancing rich fruit aromas of red berries, pineapple and ripe banana compliment the subtle aromatic oils. Finish An exceptionally long finish, with some sweet spices slowly fading, leaving the final bow to the Irish oak. Flavour The typical Pot Still spices are fortified by the Irish oak character. Robust yet mellow, clove and cinnamon give way to dairy fudge and milk chocolate sweetness combining with a touch of stewed apple. Types of Barrel used for Aging Initially aged in ex-Bourbon barrels for 15-22 years followed by a finishing period in Virgin Irish Oak Hogsheads.